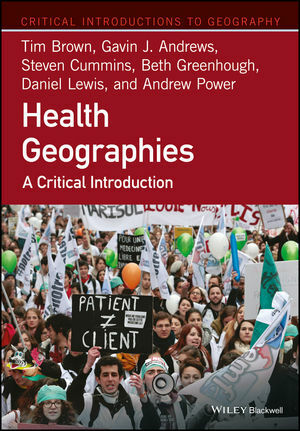 Health Geographies: A Critical Introduction explores health and biomedical topics from a range of critical geographic perspectives. Building on the field’s past engagement with social theory it extends the focus of health geography into new areas of enquiry. Tim Brown is Senior Lecturer in Geography at Queen Mary University of London. He is co-editor of A Companion to Health and Medical Geography (Wiley-Blackwell, 2010) and Bodies Across Borders: The Global Circulation of Body Parts, Medical Tourists and Professionals (Ashgate, 2015), and associate editor of The Wiley-Blackwell Encyclopedia of Health, Illness, Behavior and Society (Wiley-Blackwell, 2014). Gavin J. Andrews is Professor and former Chair of the Department of Health, Aging and Society at McMaster University, Canada. His books include Aging and Place: Perspectives, Policy, Practice (2005), Primary Health Care: People, Practice, Place (2009), and Traditional, Complementary and Integrative Medicine (2012). Steven Cummins is Professor of Population Health and NIHR Senior Fellow at The London School of Hygiene & Tropical Medicine. He has published widely across the medical and social sciences on socio-environmental inequalities in health and health behaviour and the evaluation of health and social policies to reduce them. Beth Greenhough is Associate Professor of Human Geography and Fellow of Keble College, University of Oxford. She is co-editor of Bodies Across Borders: The Global Circulation of Body Parts, Medical Tourists and Professionals (Ashgate, 2015) and has authored papers on the biomedical sciences and their impact on society, bioethics, and the history of medical research. Daniel Lewis is Research Fellow in Spatial Analysis at London School of Hygiene and Tropical Medicine. He is a quantitative Health Geographer who is interested in the socio-spatial dimensions of health, welfare, and inequality. Andrew Power is Associate Professor in Human Geography at the University of Southampton. His research interests focus on the geographies of caregiving and disability, and the post-asylum geographies of mental health. He has published widely in leading journals as well as two recent books, Landscapes of care: Comparative Perspectives on Family Caregiving (Ashgate, 2010) and Active Citizenship and Disability: Implementing the Personalisation of Support (Cambridge University Press, 2013).